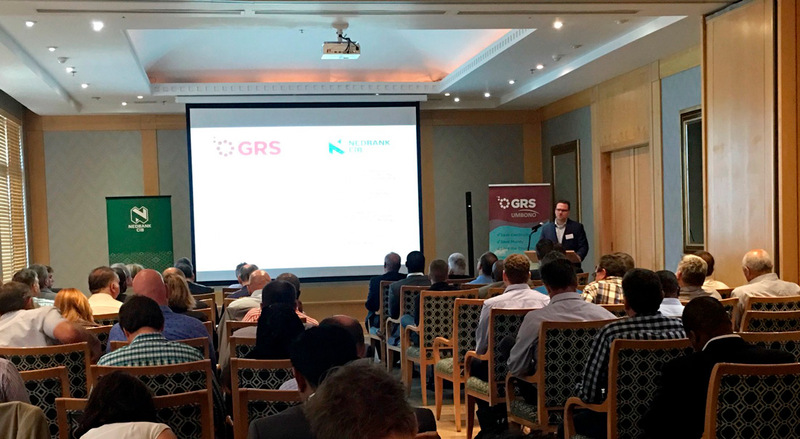 Gransolar Group in collaboration with Nedbank, a leading South African commercial bank, hosted an event on large-scale energy storage technology. Johannesburg, 10/26/2017. The event took place last Tuesday 24th at Nedbank Head Office, in Johannesburg, and was attended by almost one hundred delegates including Municipal representatives, PV Project Developers, Property Companies, Electrical Engineers, Financial Institutions, Insurers & Large Commercial and Industrial Electricity Consumers. Delegates were informed of the current market status & trends, comparative energy storage technologies, applications for energy storage, regulations, economics, financing and as well as a commercial case study which highlighted the primary levers that influence the tariff of an IPP funding structure. Dylan Tudor-Jones, Country Manager for Gransolar (GRS) in South Africa, facilitated the event which included speakers from the Industrial Development Corporation, Eskom (South Africa’s primary electricity utility), City Power (Johannesburg’s municipal electricity utility), Nedbank, as well as some Gransolar Group members: Christian Blom, energy storage specialist and Dorian Wrigley, responsible for IPP projects in South Africa. The event marks the beginning of a new era for Gransolar Group in South Africa, as we anticipate a change in direction from a shrinking utility scale PV market to a growing commercial and industrial rooftop market, which is sure to include dispatchable solar power in the future.